Integrated store, more comfort, more security - we present QUIQQQER 1.1 - Almighty Appaloosa. We've been working on this for a long time. Now we are pleased to present you the most important news. We have processed more than 700 issues, you can now find more than 30 new modules in the store. 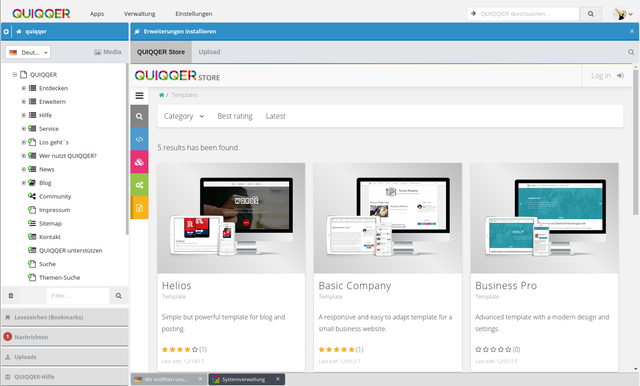 In the new version you can find the integrated QUIQQER-Store. So you can create your website even easier than before with many free modules. We have also missed an extensive update in the media area. For server admins the work in the console is now even easier and clearer than before. 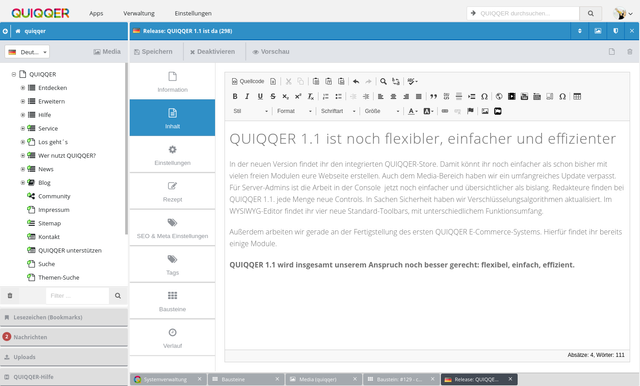 QUIQQER 1.1. offers publishers a lot of new controls. In terms of security, we have updated encryption algorithms. In the WYSIWYG editor you will find four new standard toolbars with different functionalities. We are also working on the completion of the first QUIQQER e-commerce system. For this you can already find some modules. QUIQQER 1.1 meets our requirements even better: flexible, simple, efficient. One of the core components of the release is the integrated QUIQQER store. We put an end to the time-consuming updating and installation of modules. From now on, you can install or update extensions by simply clicking directly in the backend. From now on you can find modules, templates and plugins to extend QUIQQER individually. These include, for example, team lists, a calendar, a tool for creating forms, a captcha plugin and much more. Piece by piece we publish further modules. In addition, the upload of third-party modules to the store is also planned. Just have a look at the roadmap. In the store there is a simple blog template as well as a comprehensive one with many functions for your business. With the building block module you can create modules that exactly fit your needs. Without developer knowledge you expand your project just as you need it. Places content, banners, news or blog posts, images, sliders and more with just a few clicks. The cache module stores and optimizes files of your website in different caches. This makes your site faster - important for the search engine ranking. Last but not least, your visitors will be happy about the fast site. If you want to present many photos, products and pictures on your site, the gallery module is the right thing for you. It provides elaborate and representative galleries for your project. Choose the one that fits your project from different types. 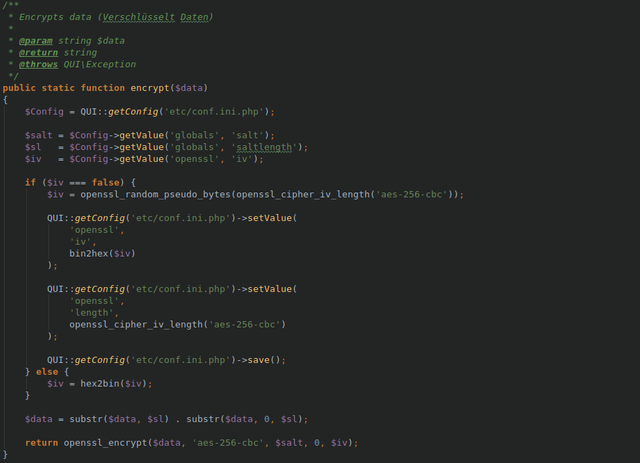 Developers will find PHP and JacaScript controls here. With the Contact and Formbuilder modules, the time-consuming development of contact, offer or registration forms is a thing of the past. You create forms and contact fields in no time at all, exactly to the extent you need them. All modules that you download from the QUIQQER Store can now be installed directly. So far, this has only worked via the update server. Now you can create your website even easier and faster according to your individual wishes. To get to know the QUIQQER modules even better, we will introduce them to you step by step in individual blog posts. The entire media area is now easier to use. You can select and process files multiple times or filter file views. You no longer need to download one file at a time. From now on it works with whole folders. For your uploads there are extensive adjustments in comfort and functionality. You can integrate the file management of the Folder Viewer everywhere. Developers will find a significantly enhanced Media Area API with extensive controls for managing and uploading files. All in all, the QUIQQQER media area is now even more comfortable and clearer. 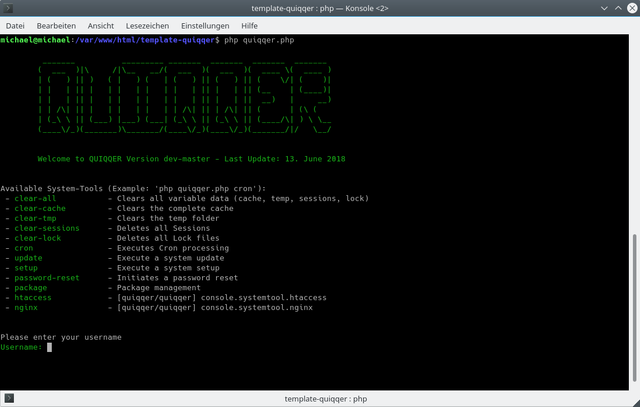 For administrators, QUIQQQER 1.1 includes a comprehensive update of the CLI tools. There are quick tools that work without login. Here you can now call all important admin tools faster and also in case of system errors: Clear cache and sessions, run crons, setup and update, create htaccess /nginx settings, reset password and more. QUIQQER now provides a fully generated configuration for nginx servers in a Debian/ubuntu environment. This simplifies the configuration of new systems and automates updates for rewrite rules and other server configurations. A comprehensive guide can be found in the wiki. We also updated the directory structure and adapted it to the Composer packages. The entire menu structure has been redesigned, rearranged and made easier to reach. 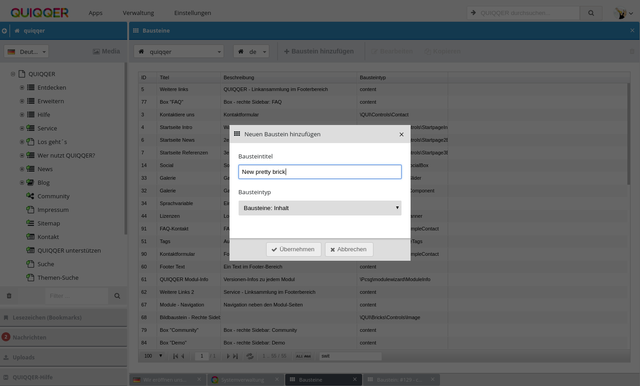 The search function in the backend has been completely revised. You can now use the quick search to find all items that appear in the backend - whether menu/navigation, pages, media area, users or groups. The backend search provides an extensive API. Apps, modules or plugins can be added and search results can be delivered directly to the admin area. So you can search QUIQQER completely and then jump to the corresponding element. 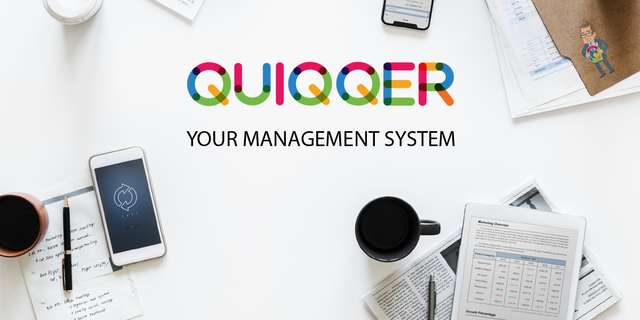 QUIQQER is now even faster and easier for admins to use. Already in the QUIQQER basic system you can encrypt user and other data. Now the encryption algorithms are updated and partly customizable via the configuration. Also, you can now use the XML APIs to automatically encrypt attributes when saving them to the database. We are currently working on the first version of the QUIQQER e-commerce system. A payment interface and corresponding modules such as Amazon, Paypal and Paymill, an ordering system, invoice management, extensive product management with freely configurable product fields, a discount system and many other small ERP modules are already ready. QUIQQER is an uncomplicated, free content management system (CMS) with open source license. With QUIQQER you can quickly and easily implement your projects - whether web services, movie sites, blogs or internet portals. Thanks to the modular structure, you can adapt the system to your needs at any time. Very well presentation! Thank you for the great post. I wish I had chance to provide more feedback about the post but it is hard since the contribution is amazing in many ways; language, wording, visuals, great structure, detailing and much more. This is the kind of blog posts that totally fits the expectancy in the category. I might show this as a good example to contributors in future. I think you can add some linking to prior posts to ease tracking for followers of QUIQQER. I would be glad to see an option for English language in your official website to add it my list. Forgive me if I am missing it and please provide a link for. Thank you again for the contribution, we wish you interact more with Utopian for your future blog posts. We are unfortunately extremely busy, therefore we have not yet come to an english page :( or an english documentation. We are now at a state where other developers can use it... so we still have a lot of work ahead of us. Thanks again for the kind words. We like to hear that and it gives us even more motivation! Here's a tip for your valuable feedback! @Utopian-io loves and incentivises informative comments. Learn how to contribute on our website. Congratulations! Your contribution was Staff Picked to receive a maximum vote for the blog category on Utopian for being of significant value to the project and the open source community.